In soccer (or "football," if you're anywhere but America), the striker resides deep in enemy territory. He's always looking for an opportunity to score the goal that crushes the opposition's spirit. He must be fast, nimble, and durable enough to stand up to the oth ... (see full details) (see specifications) #DNN43013. In soccer (or "football," if you're anywhere but America), the striker resides deep in enemy territory. He's always looking for an opportunity to score the goal that crushes the opposition's spirit. He must be fast, nimble, and durable enough to stand up to the other side's bruising defenders. If you want work boots that help you crush the opposition (even if it's just another work day), grab a pair of Danner Men's 43013 Black Leather Striker Torrent Waterproof 8-inch Side-Zip Boots. Designed for speed and constructed for stability, these men's boots are built on Danner's lightest and most versatile TPX platform, the TFX-8. This system has a cross-stitch design that provides added durability and stability in the lateral toes and medial heel pivot zones. That means that these leather boots won't wear out with all your juking and jiving. For added stability, they also feature the rubber Vibram Striker Torrent outsoles that have a 360-degree pentagonal low-lug pattern for grip in all directions. Throw in the flex-notch design in key pivot areas and water-shedding outer lug pattern, and you'll have almost pinball-like agility. While you're making outrageously sharp cuts and turns, your feet will be wrapped in comfort. 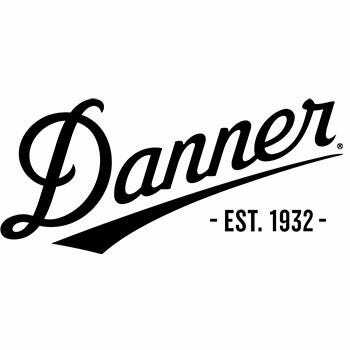 These 8-inch Danner boots have removable cushioning polyurethane footbeds, and the polyurethane midsoles provide superior cushioning while adding durability. Lightweight polyurethane is excellent at shock-absorption, so you'll experience less foot fatigue in your forays. Lightweight nylon shanks add more stability and support to these black boots, but the best comfort feature is the Gore-Tex waterproof breathable lining. Gore-Tex works like your skin - billions of tiny pores allow moisture (like sweat) to escape but are too small to allow moisture in. Dry feet are happy feet. Men's footwear can have all the comfort and speed features, but if they get trashed after a week of hard work, they're worthless. Well, not these. In addition to the durable, polishable full-grain leather, the uppers are also built with rugged and lightweight 1000-denier nylon. This combination of leather and nylon is lighter than regular full-leather uppers and is softer on your feet. They also have less break-in time, so you can get up and running quick. To help you get up and running even more quickly, these black boots come with a semi-locking side zipper, so you can pull them on easily. The speed lace fastening system ensures a secure fit, while the lace garage keeps your laces stowed tightly so they won't snag on anything. After all, you want to be a striker, not the doofus who trips on his own shoe laces. Get a pair of Danner Men's 43013 Black Leather Striker Torrent 8-inch Side-Zip Waterproof Boots and the crowd. Will. Go. Wild! Danner Boots: Men's 43013 Waterproof Black Side-Zip 8-Inch Striker Boots is being added to your cart.